Our program is located in Long Beach, California and we currently host about 4 cafés each year. Being in an aquarium makes us sort of unique. We not only have access to amazing staff and researchers but the animals and exhibits as well. For example, we recently had a café about shark eating habits so then the students were able to go touch some live sharks. My background is archaeology, geology, and informal education. I am currently the youth volunteer coordinator and oversee many of our high school volunteers. 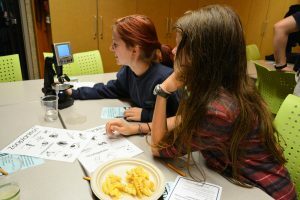 When I was new to the role, I heard about Teen Science Cafés and thought, I need to be part of that! My coworkers had already laid the foundations and I was lucky enough to join in and help expand the program. 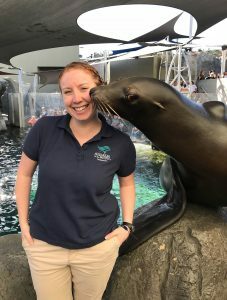 We are based at the Aquarium of the Pacific, the mission of which is to instill a sense of wonder, respect, and stewardship for the Pacific Ocean, its inhabitants, and ecosystems. I think the program fits perfectly! Our speakers help inspire participants, increase their awareness of issues, and show young people how they can get involved themselves. 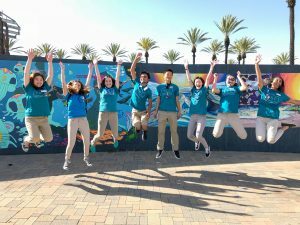 Our teen leaders also participate in trash clean ups, wetlands restorations and outreach events so we get to see them being stewards in their own community. Scheduling! I am very lucky to have a group of dedicated leaders that are consistent in planning meetings but event attendance doesn’t always seem to match our marketing. Most times we sell out but occasionally we will have lower numbers and are not quite sure why. Or sometimes we find out later it overlapped with events we didn’t account for such as finals, proms, or sports. They have all been great for their own unique reasons. One of my personal favorites was our café about tardigrades. 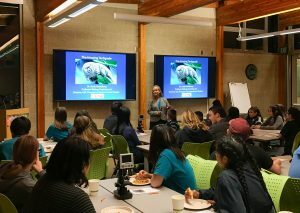 The topic was fun, the speaker was amazing, and we had live tardigrades for the activity. The event sold out and it was just great to see all the components come together so well. Tardigrades and pizza, a winning combination. I am incredibly proud of the teen leaders! They are constantly coming up with new ways to improve and grow the cafés. Our teen leaders work hard but also know how to have fun! Café guests search for plankton.